Why Choose Kentucky for Online Higher Education? Kentucky wants its residents to enjoy higher incomes, accelerated job growth, and improved quality of life — all of which is aided by earning a college degree. The state launched the 60×30 initiative in 2016 to improve the number of Kentucky residents with some form of postsecondary credential or a degree to 60% by 2030 from the 45% rate a year earlier. Kentucky schools took this to heart and responded with more flexible attendance options for students, including fully online degree programs. 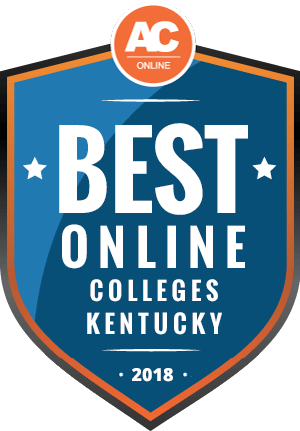 This guide explores the cost and benefits of attending an online Kentucky college with a ranking of the top most affordable online colleges in the Bluegrass State. Our guide provides answers to common questions regarding online programs, enrollment deadlines, transfer credits, and financial resources. Online programs make a postsecondary degree much more attainable for individuals who face challenges attending a brick-and-mortar campus. Single parents, full-time workers, or individuals in remote areas find it difficult to juggle their many responsibilities with a set class schedule and drive time. Asynchronous course scheduling puts the student in control of their education and makes the dream of a degree a reality for thousands of students each year. Kentucky’s public and private colleges offer 67 degrees that can be completed online, with more than 26,000 students taking advantage of the opportunity. Public universities in Kentucky offer discounts on tuition for residents of the state. The state looks at the student’s permanent home. Students who enroll as out-of-state students and attend school full-time cannot change their residency status without convincing evidence of a change in their permanent address. Most schools offer exceptions for military members and families. Some schools extend the in-state tuition benefit to residents of nearby counties in neighboring states, as students from certain counties in 18 other states may qualify for reduced tuition and special scholarships, while other schools charge students a flat fee per credit hour. The average cost of tuition and fees at Kentucky schools remains lower than the national average for both in-state and out-of-state learners at four-year universities. The cost to attend two-year colleges, however, is higher for both in-state and out-of-state enrollees. Policies regarding fees for online programs vary from school to school. Some schools allow online students to pay a flat rate when enrolled as a full-time student and may charge an additional fee per credit hour for the online course. Other schools may not offer full-time enrollment discounts for online students, so these enrollees would pay per credit hour. However, online students may also benefit from reduced campus costs, such as lab fees, activity fees, parking fees, or housing and meal plans. Thousands of out-of-state students choose to attend online colleges in Kentucky each year. Approximately one-third of students seek undergraduate degrees, but two-thirds seek graduate-level degrees. Kentucky participates in the Southern Regional Education Board (SREB), a consortium of 16 states that allows students from the member states to seek specialized education through a Kentucky school at in-state tuition rates. Reciprocity agreements also help students to pursue degrees from Kentucky online colleges, though out-of-state students should ensure their school has gained authorization to serve students in their state. The SREB offers an Academic Common Market/Electronic Campus (ACM/EC), which allows students to seek certain online degrees through out-of-state member schools with in-state tuition. The partnership includes 16 states in the Southeast, from the coast to Texas and Delaware south to Florida. The SREB’s ACM/EC provides access to online learning programs across the country, helping adult learners complete their degrees or enhance their professional development. On average, these partnerships can save students $4,000 a year at an in-state university and up to almost $9,000 at two-year colleges. Many schools participate in tuition incentive programs that offer reduced tuition and scholarship opportunities for out-of-state students from specified counties in 18 states. Before a school may offer educational services to students in Kentucky, it must gain approval from the Kentucky Council on Postsecondary Education. This approval ensures schools meet certain quality standards to protect students and ensure they earn a degree that would be recognized by employers or other schools. Authorization, however, does not take the place of institutional accreditation, and students should ensure their school has gained both. Kentucky participates in the National Council for State Authorization Reciprocity Agreements. These agreements allow schools to serve students in member states. All of Kentucky’s best and most affordable online colleges offer three or more online degrees and maintain accreditation at the regional or national level. Our ranking considers the average in-state net price for undergraduates, the number of students receiving scholarships or grants from the school, and the availability of job placement services, with data from The Integrated Postsecondary Education Data System managed by NCES. Explore the degrees available at these Kentucky colleges. Earning a degree can open up new career opportunities, but formats and requirements vary widely from school to school. Before choosing from the top affordable online colleges in Kentucky, consider the frequently asked questions below. Do Online Credits Cost More or Less in Kentucky? The most critical variable in determining college cost lies in your choice of school type. An in-state, two-year college often provides significant savings over a private, four-year university. The National Center for Education Statistics (NCES) reports a national average cost of a public, two-year college at $3,038 compared to a national average of $27,951 per year at a private, four-year university. The average tuition cost of schools in Kentucky remains lower than the national average. Policies regarding online tuition can vary from school to school. Some schools, such as Western Kentucky University, charge the same fee for in-state and out-of-state students enrolled in distance learning courses. WKU does not offer a full-time enrollment option, however, so students pay for each class with no discount for taking more courses. Other schools charge the out-of-state differential based on their residency status. Which Kentucky Schools Accept the Most Transfer Credits? Students hoping to transfer college credits should examine the institutional and programmatic accreditation of their college. Institutional accreditation refers to the overall accreditation status of the school, often sought through regional organizations such as the Southern Association of Colleges and Schools, but the acceptance of national accreditation agencies continues to grow. Programmatic accreditation refers to approval from industry-specific organizations, such as the Association to Advance Collegiate Schools of Business or the Council for the Accreditation of Educator Preparation for teaching programs. Most schools honor the college credits a student has earned from other accredited colleges and universities, especially those with regional accreditation. Most public, four-year universities in Kentucky also maintain articulation agreements with community colleges in the state, helping ensure a smooth transition from school to school. Most students transferring after completion of an associate degree bring with them 60 credits in general education courses and introductory courses in their selected major. However, schools often have residency requirements that state students must earn at least 30 credits of their degree at the university to graduate from the school. Many schools also will not allow transfer credit for upper-division courses unless the course meets all their curriculum requirements. For example, some business schools will not accept credits earned at a school that has not received that approval. Will Any Online Colleges in Kentucky Accept a GED? Kentucky colleges require all applicants to have achieved a high school diploma or the equivalent General Education Diploma (GED). Many schools need additional documentation with the GED documentation, such as the completion of an approved home-school curriculum or distance learning high school program. Once accepted, however, students may need remedial or development classes to prepare for their college-level courses, increasing the student’s tuition costs and the time they need to graduate. ACT scores help show students have the necessary preparation to succeed in college-level classes. Some schools administer a Composite Admission Index Score to determine a students admission status and any academic deficiencies. Schools may also restrict online learning to students who have completed some college credits already or require students to complete an orientation. Online classes require students to stay organized and manage their time independent of a teacher’s instruction as well as some technical ability to access resources. Do Any Online Colleges in Kentucky Start Every Week, or Month? Kentucky’s online colleges provide a variety of attendance options that go beyond simple full-time or part-time scheduling. These flexible scheduling options help students to balance their school-life responsibilities, allowing them to pursue their degree as soon as possible, rather than wait for a yearly or semi-annual start date. For example, Eastern Kentucky University in Richmond offers accelerated eight-week classes through its online programs with six starting dates per year. Benefits of this schedule include the ability to focus on one or two courses at a time and earn more credits in a year. Other schools have launched on-demand courses. The Kentucky Community and Technical College System offers self-paced courses ranging from 6-15 weeks in the fall and spring and 6-10 weeks each summer, with Monday start dates throughout the semester. Western Kentucky University has developed on-demand competency-based programs. Students progress at their own pace in learning the skills and information necessary to move on to the next course. Students can accelerate their degree progress, apply prior learning to earn college credit. WKU currently offers one bachelor’s degree utilizing the on-demand format, and the school does require applicants to have already earned an associate degree or completed the general education degree requirements. Which Online Colleges Will Accept FAFSA in Kentucky? All colleges that participate in federal or state student aid programs accept the Free Application for Federal Student Aid (FAFSA). Financial aid programs include the Pell Grant or the Kentucky Higher Education Assistance Authority College Access Program or Kentucky Tuition Grant. Students graduating from high school will need their income and tax information from their parents, while those older than 24 do not need these materials, as the federal Department of Education considers them independent students. Many schools also use this information to determine which institutional grants or scholarships applicants may qualify for, especially awards with a need component. The school’s financial aid office uses FAFSA information to calculate the student’s estimated family contribution and any applicable aid, such as work-study programs, institutional grants, and state and federal aid, as well as any merit-based scholarships the student may receive. Are There Any Free Online Classes I Can Take From Kentucky colleges? The University of Kentucky developed two online courses for students in cooperation with online educational provider Coursea. Two chemistry courses help students build the skills and gain the knowledge needed for college-level chemistry classes. Though designed by UK faculty and offered in cooperation with the school, these classes serve as preparatory courses and do not count towards a student’s credit requirements. However, students looking to brush up on their chemistry skills will find the classes helpful. These free courses can also help students determine if they possess the discipline and time management skills necessary to succeed in an online degree program before investing their time or money in a for-credit program. Kentucky offers some in-state students the opportunity to earn an associate degree at no cost through its Work Ready Scholarship. The last-dollar program bridges the gap between student aid and tuition. Students must not have earned an associate degree and must study a high-demand subject, such as healthcare, businesses services, advanced manufacturing, or transportation and logistics. Once enrolled, the student must meet academic standards. Funding ends once the student earns an associate degree or 60 college credits. How Can I Find the Online Program Options at Kentucky’s Colleges? The Kentucky Virtual Campus (KYVC) serves as a clearinghouse of information about online college programs available from public and private colleges across the state. Programs offered may count towards degree completion, serve as continuing education for busy professionals, or provide certifications to enhance workforce skills. Schools must meet quality standards before participating in KYVC, such as maintaining institutional accreditation through the Southern Association of Colleges and Schools, as well as authorization to offer programs in the state by the Council on Postsecondary Education. KYVC launched to help potential students overcome obstacles in completing a degree, such as distance and cost. All KYVC online degrees must offer at least 75 percent of required classes online, and host schools must ensure their distance students have access to financial aid programs, library resources, computer services, student services, and reasonable accommodations for students with disabilities. Need-based or career-based grant programs can help students defray the cost of earning their online degree. The federal Pell Grant offers up to $6,095 annually for students with significant financial need, determined by the FAFSA. Kentucky also offers numerous student assistance programs, granting $99 million in need-based awards in 2015-2016 and another $119 million in specialized grants without a need component. Many grants, however, only support students seeking an undergraduate degree. Students seeking master’s or advanced degrees should research state and institutional scholarships, as well as awards available from private organizations. Administered by the Kentucky Higher Education Assistance Authority, this scholarship assists Kentucky residents seeking a credential or degree in early childhood development. Applicants must be employed at least part time in an eligible preschool or early childhood program, or as an associate teacher in state-funded pre-kindergarten programs. Kentucky offers this scholarship to recruit talented new teachers to work in schools across the state. Applicants may work toward their teaching degree or seeking additional endorsements for their teaching license. The Kentucky Higher Education Assistance Authority bases award amounts on financial need. In return for scholarship funding, teachers agree to work in a Kentucky public school, working one semester for each semester of funding received. Residents of the 33 coal-producing counties in Kentucky may apply for funding to complete their bachelor’s degree. Students must already have earned an associate degree or 60 college credits and maintain good academic standing. The scholarship provides funding to complete a first bachelor’s degree from a public or private institute located in one of the coal-producing counties. Students attending a school outside the region may gain special approval if none of the regional colleges or universities offer their course of study. The Kentucky Federation of Business and Professional Women works to ensure the state has a qualified workforce that meets the needs of future employers and industries. Their grant program offers financial assistance to Kentucky citizens currently working in the state or planning a career there. Applicants should maintain current enrollment and individuals may only receive funding every two years. Now in its 27th year, the Kentucky Broadcasters Association awards up to four scholarships annually to students majoring in communications or who have demonstrated an interest in a broadcasting career. Applicants must maintain Kentucky residency and have reached their junior year at a Kentucky college or university. The committee considers academic achievement, with a 3.0 GPA desired, as well as extracurricular involvement and faculty recommendations. Students in good academic standing may renew the award for a second year.